In 2016, almost 10 million people in the United States suffered from an addiction to gambling. Now that we have electronic devices, we can gamble from the comfort of our home and traveling to Las Vegas is no longer necessary to place a bet. This means those with a gambling addiction will be able to hide loses better and more easily go into debt. Knowing the signs of gambling addiction is important, though it can be difficult to recognize. Believe it or not, gambling addictions come in all ages, sizes and styles. Not all who gamble are addicts. People who consider themselves professional gamblers do not consider themselves addicts. They typically understand the inevitable risks and losses that come with gambling. These gamblers usually progress into casual social gambling, which is less risky. These gamblers do not bet frequently and will rarely develop a problematic gambling habit. If a social gambler became addicted, it would be due to a traumatic event or big win. If a person has only one hobby, and it is gambling, they are a Serious Social Gambler. This type of gambler could be considered a fanatic. Someone with an antisocial personality disorder and a gambling addiction is highly likely to illegally fix bets. These gamblers could have a history of unlawful behavior. They are often characterized as deceitful, manipulative, charming, without remorse, impulsive, irritable and aggressive. These gamblers place bets to escape the feelings of anxiety, depression, boredom, anger or loneliness that they experience in their personal life. This type of gambler is vulnerable to compulsive gambling. The Compulsive-Pathological gambler has no control over their gambling habits. A gambling addiction can be highly comorbid with other mental health and substance abuse disorders. The addict will likely tie their self-worth to losses and wins. This is a serious addiction and it is highly unlikely that an individual will be able to overcome addiction without treatment. Ask for loans because they need more money for gambling, so they can reach a desired level of gambling enjoyment. Only find enjoyment in gambling; either reliving past gambling experiences, planning future bets or thinking of ways to finance gambling. The person may be socially withdrawn or disappear for long periods without explanation. Gamble to relieve depression or anxiety or they become agitated when they try to reduce or stop gambling. Mood swings, lack of concentration and insomnia are also common issues in gambling addicts. Lie to family or loved ones to hide the extent of gambling behavior. This could be an increase in generosity because of winning large amounts of money. Show poor decision-making skills like; committing fraud, forgery or stealing for gambling funds. They may even secure illegal loans to finance gambling. Many seniors do not want to discuss a gambling issue with anyone, whether due to embarrassment, fear of losing respect, or fear of losing independence. Approach the subject delicately and do not judge the addict for what they are going through. Seniors can be reluctant to admit their addiction. This is especially true if they have had no blemishes to their reputation. What Causes a Gambling Addiction in Seniors? Problem gambling is often triggered by severe stress caused by major life changes. Seniors can encounter social isolation after retirement or loss of a loved one. Even those with no previous history of addiction can become problem gamblers. There are some risk factors that can make some seniors more vulnerable to a gambling disorder. One of these factors is loneliness. There are many seniors who find themselves alone later in life. Many women outlive their husbands, this makes them more susceptible to gambling because of loneliness. Women make gambling a social thing, like bingo. Women are the fastest growing group of problem gamblers. Gambling can be used as a distraction for many seniors who experience physical aches and pains. In this case gambling provides a diversion for the gambler, bringing a sense of relief to the addict. Another factor in senior gambling is convenience, with telephone betting and internet gambling growing at an alarming rate, seniors are involved in more gambling than ever before. Convenience is even present in senior care facilities and homes for the elderly where they are encouraged to take part in bingo outings or bingo is held as a social activity in the facility itself. When convenience is paired with plenty of free time, seniors can take a day of boredom and fill it with an activity. There are plenty of seniors who suffer from disabilities and limitations. This makes many activities very difficult, except for gambling. Gambling can be done while sitting down, in the home of the gambler or even when addicts are bed-ridden. Since many seniors will be reluctant to confess their gambling addiction, the problem may only come to light when they have apparent financial problems or when their behavior is monitored. The first thing needed to properly treat a gambling addiction is an accurate diagnosis. This will require complete physical and psychological evaluations. When the problem is identified through professional help, a likely treatment will be cognitive behavioral therapy. Some medical conditions or medications can cause an individual to develop erratic, impulsive behaviors, including gambling problems. Knowing the cause of the gambling addiction is important for treatment. If a gambling disorder is caused from cognitive issues, the person addicted may no longer understand the consequences and may not even realize the significance of their financial losses. 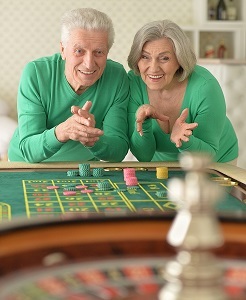 Cognitive issues or dementia can be emotional reasons behind senior gamblers. If possible have a trusted family member or friend manage finances and limit the seniors spending money. Senior gamblers will be evaluated to establish if dementia is causing the gambling disorder. Early treatment is important in treatment for a gambling disorder and what may be causing the disorder. There are millions of reasons why a senior could be addicted to gambling; no matter what the reason behind the disorder, it is important to seek out professional help. Recovering from a gambling disorder is not easy. Recovery takes hard work and plenty of encouragement. It is important to understand that gambling has similar effects on the brain as drugs and alcohol addictions, therefore stopping is not easy. Encouraging your loved one that help is available, they need to receive help and that help will work is key to overcoming the addiction. Make it clear that their gambling disorder affects others. At times confrontation can be difficult, if you have concerns that someone close to you is suffering from a gambling addiction, you should say something to them, sooner rather than later. Remember some people may be glad that you brought up the issue, some may think you are accusing them of something and others may just refuse to talk about it. If they do not want to talk about it, don’t push it. Gamblers anonymous has a hotline list for each state in America. There are helplines provided for those outside the United States. Search online for a hotline in your area. Lindsay Engle is the healthcare expert at MedicareFAQ, a learning resource center for senior healthcare. Lindsay loves working in the healthcare industry. Aside from her job, she has a great passion for animals and loves boating. In her spare time, she enjoys snuggling on the couch with her pets as well as fishing with her boyfriend.